The Pieps DSP Pro was discontinued in 11/2018. It has been replaced by the Pieps Pro BT/Black Diamond Guide BT (don't confuse the "DSP Pro" with the "Pro BT"). Summary: The Pieps DSP Pro replaced the original Pieps DSP shortly after Black Diamond acquired Pieps in 2013. The Pro includes the strengths of the original DSP plus numerous notable enhancements. And the DSP Pro costs $75 less than "Old Yellow." The Pieps DSP Sport is the Pro's fewer-featured little brother. Depending on your needs, the additional features in the Pro are enhancements or unnecessary. This page explains the Pro's additional features—see the review of the Sport for the features that are common to both the Sport and Pro models. Most of the Pro's additional features are accessed via the additional "Scan" button. The Scan button's behavior is not intuitive (e.g., press and hold both the Scan button and the Flag button for three seconds while in Search mode to search for your dog's TX600 collar). If you don't need the extra features, ditch the Scan button, save $100, and go with the Sport. Increased Range. The Pro has a suggested search strip width of 60 meters versus 50 meters for the DSP Sport. Pieps says that this increase was achieved by using a different, and more expensive, antenna. However, in the 21 range tests I have performed with Sport and Pro transceivers, the ranges are statistically identical. Revert to transmit. As with the Sport, the Pro can be set to automatically revert from searching to transmitting if the transceiver doesn't receive a signal while searching. The Pro auto-reverts after one minute without motion whereas the Sport auto-reverts after a fixed number of minutes. The auto-revert feature can be enabled/disabled only at a Pieps service center. These beacons give plenty of warning, both before reverting and after, so you don't mistakenly revert during a search. Pieps prefers the use of a Pieps Backup. Learn more about the DSP Pro's auto-revert function. Battery Life. The batteries last longer in the DSP Pro and DSP Sport than in the earlier (yellow) DSPs. The DSP Pro has a published battery life of 400 hours of transmitting versus 200 hours for the DSP Sport. The Pro's 400 hours are about double all other transceivers. Group Check: The Pro can test the frequency, pulse length, and period length of other transceivers. To use this feature, turn on your Pieps Pro and then press-and-hold the Flag button when "CH" appears on the display. When your Pro is held within one meter of a transmitting beacon, it will display the distance to the transmitting beacon (i.e., between 0.1 and 0.9 meters). "Er" will be displayed if the transmitting beacon is not within specifications. Scan function. Pressing and releasing the Scan button while searching clears all previously suppressed signals and display the number of transmitters within 5, 20, and 50 meters. The scan function is available on the DSP Pro and the original DSP (but not the Tour or Sport). The Scan button was labeled either "(((" or "?" on earlier DSPs. The scan function is handy during a multiple burial search. It will provide information not only on the number of burials, but their approximate distance. This can help you determine, for example, if two victims are buried close to each other (i.e., a "close proximity" burial). Frequency measurement. Pressing and holding the Scan button for at least three seconds while searching enables the DSP's frequency tester. Releasing the button turns off the frequency tester. TX600 support. Pressing and holding both the Flag and Scan buttons for three seconds while searching tells the Pro to search for a Pieps TX600 Dog Transmitter. To return the Pro to normal search mode, toggle the transceiver to Send and then back to Search. Inclinometer. Pressing and holding the Scan button for three seconds while in send mode enables the Pro's inclinometer. Understanding and measuring slope angles is a key skill when traveling in avalanche terrain. A significant disadvantage of using your transceiver to measure the slope is that you'll need to take the transceiver out of its secure pouch and hold it in your hands. If an avalanche strikes, it's likely your partners will unbury your transceiver rather than you. It is far better to use a dedicated avalanche inclinometer app. Read the review of the Pieps DSP Sport to learn about the features that are common to both the DSP Sport and DSP Pro models. 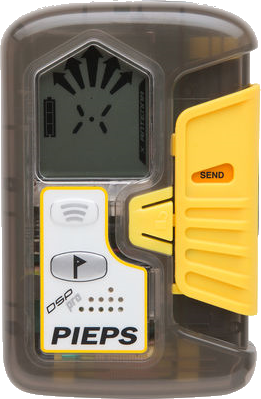 Pieps also sells a transceiver named the Pieps DSP Pro Ice which is simply a DSP Pro in a translucent case. Pros: All the "Pros" of the DSP Sport plus longer battery life, frequency testing, inclinometer, scanner, and slightly longer range.